In today’s final picks, we are bringing you our Gold, Silver, and Bronze medal winners as it relates to the Walt Disney World resorts. We have already brought you the Magic Kingdom, Epcot, Disney’s Animal Kingdom, and Disney’s Hollywood Studios Gold, Silver, and Bronze medal winners, so all that is left to do is to pick our favorite three resorts. Let’s get started! The picture at the top was taken from the area by the 11th floor elevator landing at Bay Lake Tower, and is one of my favorite photographs. In addition to the incredible shots, I really enjoy the pool, especially that water slide on the right! That is such a cool water slide. If you lay down on it, you’ll whip around those curves faster and faster, and enter the water like a torpedo. Also, if you are watching from the pool, you’ll see the people go by, and it’s like watching a shark pass by underwater. Really cool! Kidani Village is where we stayed this past June, and it was everything that it could be and then some. We had a fifth floor Savannah view room, and it was so cool to be able to look out on our balcony and see the animals out on the Savannah. If you have never stayed at Kidani, you should! 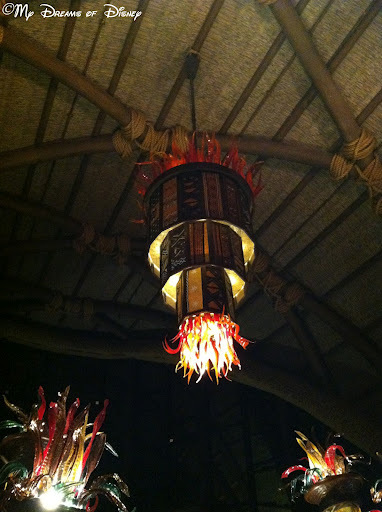 The picture on the left is some of the lighting in the Kidani lobby. In a previous post, I shared more photos of some of the sights to see at Kidani Village, if you missed it, why not take a moment and take a look? For Moderate resorts, I think Port Orleans French Quarter is the best in class. It is the smallest of any of the Walt Disney World Resorts, so it is quiet, but it also has a lot going for it, from a great food court, to water taxi access down the Sassagoula River to Downtown Disney, and even walking paths up to Port Orleans Riverside. What I like best, though, about French Quarter is how much like the French Quarter depicted in Princess and the Frog Port Orleans French Quarter is. When we stayed there, it was great, but then, when I saw the movie for the first time, I felt like I was right back at the resort! So, now that I have shared my Gold, Silver, and Bronze winners, here are the ones that Cindy and Sophie picked. After you read their picks, tell me what you think of our choices, and let me know what your three picks are! Thanks!